“Hande Öncü escaped from the transphobic violence in Turkey and settled in Vienna, which she thought a safe place in Europe. There she was murdered. While from an educated family – Ay told kaosGL.org that her father is a police commissioner, her brother and aunt are lawyers – the family did not accept Öncü’s body. Additionally, they did not give permission to facilitate the transfer of her body back to Turkey. Despite this, Trans Angels rolled up their sleeves and collected the necessary amount of money to bring the body to Izmir for an Islamic funeral instead of cremation, the usual process for unclaimed bodies of asylum-seekers in Austria. 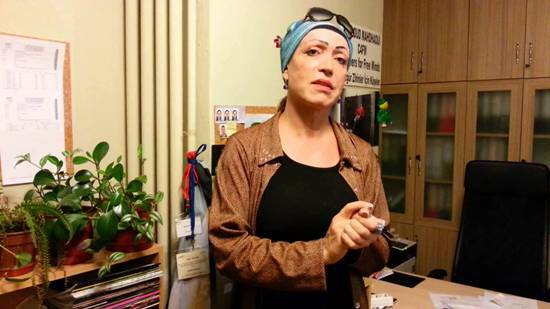 Ay said due to Öncü’s gender identity that the family chose to watch from a distance rather than go to the funeral, which was attended by approximately 100 trans women. A week after, Öykü Ay was in Izmir again. This time for the funeral of Madonna, leaving her amazed by an unexpected embrace. Ay appreciates the family’s hospitality who served their guests tea, halva, ayran and pita as part of a well-established funeral tradition in Turkey. “This is a matter of credibility, it did not happen overnight”, Ay explains. “We learned that no one would help us. Now we are well aware that we have to heal our wounds ourselves. We have no friends but ourselves, just like we have no enemies but ourselves. We all know the difficulties we face. We are aware of the importance of solidarity. Therefore, everyone takes on responsibility willingly. Edit: Hande Öncü’s date of the murder was corrected from January 26 to January 19. We apologize for this error.